Although the title sounds like three different videogames bashed together, this very entertaining martial arts series pits the murderous underground art of Nanshin Shadow Style against the world of Pro-Wrestling. 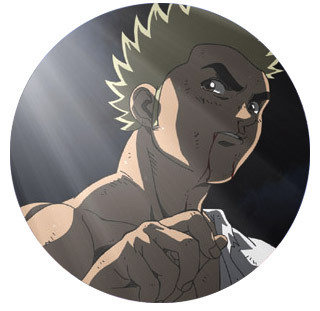 Protagonist Kiichi and his no-nonsense, hyper-deadly father are challenged to fight a wrestler hell-bent on a grudge match. Ultimately, our hero must seek further training from the man who trained the assassin he must face down in the ring! We particularly enjoyed the chemistry between the father and son duo, they are so different, and yet, there's a strong bond between them. As can be expected these days from any OVA series, the animation is excellent, and the dub is enjoyable. 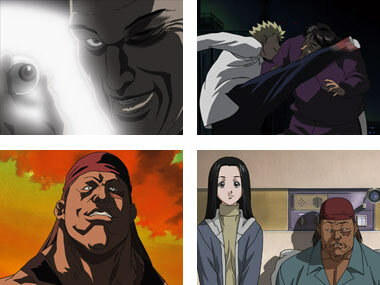 Below: Scenes from ShootFighter Tekken.